How lame that the only time I've posted recently has been to do a link-up. Don't judge...I'm just a lame-o. Did you catch Jen's 7 posts in 7 days challenge? Clearly I didn't take her up on it. ;-) But, I'm really glad that she made the challenge because it was so awesome to see one of my favorite blogger, Anne, posting daily this week. We originally e-met on Catholic Answers Forums and later got to know each other better in a Facebook group. She is an awesome mom, so fun to read, and she's a great e-friend! (I'm sure she's a super awesome friend in real life too, but alas, I haven't met her yet) . I haven't done a real update on my weight loss journey for a while, so I'm just going to do a mini-update here. I got to 267.5 last week. This is so amazing! I haven't seen lower than 270 since before I hit that when I was pregnant with Christopher on my way up. I'm really feeling great! My diet is kind of hard to stick to, but the trainer gives me one day a week to "cheat". I use Sunday generally and whether it's a breakfast that I don't normally eat, or we go out I splurge a little. But, I still try to keep it in moderation. A couple weeks ago we went out for our favorite breakfast, a breakfast burrito with hashbrowns and chocolate milk. Before I would have eaten all of my food plus 2 cups of milk. This time I didn't finish my food and only one cup of chocolate milk. I'm incredibly impressed with the changes that I've made and am still making. Oh, and the best moment of my work-out life happened last night. We were bike riding and Jason said that I was giving him a run for his money! I mean granted, he's pulling the boys in trailers on his bike, but still impressive if you ask me. So my workout schedule is getting a bit more intense, but I also feel like I'm handling more. I do 45 minutes of cardio 6 days a week now and then I do weight lifting with the trainer 2 days a week. On top of that we've been riding our bikes to Mass this week in the morning. It's only 10 minutes one way, but it feels nice to be doing something more active. And this weekend I think we're going to drive to Garden City and ride their really nice trail through the city and maybe go to the (FREE!!!) zoo after. It's just so much more activity than I've ever done before, and I'm just really feeling so great about my progress. Don't get me wrong, I know I still have so much work to do, but I know that I'm on the right path and that's positive. OK, enough of the bragging. ;-) At the risk of this being seen by tons of people who disagree, I'm going for it. This was NFP Awareness week and I'm soooo glad it's almost over. Lots of people did some great posts about NFP and you can check them out at Katie's because she had a link-up. Tons of great information. So why am I glad it's over? Well, if you follow my blog you might know that we don't use NFP. We have chosen to not try to avoid except for some certain, very extreme reasons (that haven't happened for us, but obviously could at some point); and you know that I think that in general we as a society are not as open to life as we could be. Yet, I really appreciate NFP and the knowledge that is available for people whether they want to use it to conceive or to avoid because they, as a couple, have prayerfully discerned that they need to avoid at this time in their lives. (I inserted that "as a couple" because it is a decision that couples make together and I make no judgements on why or if they should, in general I don't even think about it.) I'm mostly glad that NFP week is almost over because I'm so over this current trend to just prove that NFP is "as good, or better" than forms of contraception. Because what that does, and I even almost typed it, is present NFP as another form of contraception. This is how those posts come across and I think that it unfairly makes it seem to non-Catholics that NFP is just Catholic birth control. Also, I'm super sick of the implications that because I don't use NFP I don't understand my body and that my husband and I must not communicate as well or as often because we aren't charting together. I'm hopeful that is not the intention of most posts, because I know a lot of these women from online interactions and I don't believe them to think in that way; but it still rubs me the wrong way and has the tendency to make me feel defensive. For this reason I've avoided commenting on any tweets I've seen. So, anyway, NFP awareness week, definitely check out Katie's blog and look at some of the links and posts because they've been full of useful information. The boys' birthdays are fast approaching! They are only 18 days apart but I'm going to do my best to keep them separate until and if they decide they would rather have their birthdays celebrated together (but really...birthday cake twice a month? who's going to argue with that? ), so I'm working on plans. For Dominic, who has been obsessed with fish lately, I'm thinking I am going to make this cake. We'll get some ice cream and I think we'll have the family all come to the park where the kids can all play and everyone else can hang out comfortably. Christopher seems to just really like candy and frosting right now so I think I'm going to make cupcakes with mounds of frosting for him to eat and maybe some smarties or giant sprinkles. Yes! We have vacation scheduled! We aren't going anywhere major, as obviously Christopher has surgery scheduled for the middle of it. But we are going to do a couple days in the Denver area doing some things that we haven't done at all or in a while. We'll be visiting the museum with the boys' cousins and hopefully make a trip to one of Denver's Little Monkey Bizness. The boys had a blast the last time! And the rest of the time we hope to just enjoy being together as a family. Maybe some trips to the swimming pool and lots of playing! For more Quick Takes, head over to Jen's! I saw an awesome post about NFP failed them and that's why they don't have a big family. It was refreshing to see someone shouting about using NFP to achieve, rather than using it to avoid. Because like you said, it shouldn't be a contraceptive. 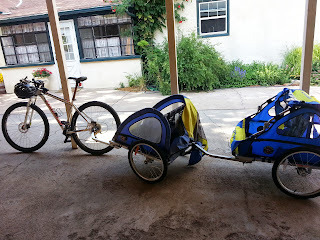 I am throughly impressed with that bike trailer set up. That must be intense to ride.